Here I am charmed with endlessly intricate and gloriously unpredictable coastline, here lies a region with chic resorts, restaurants and abundant strands of sand bustle with life and energy – a perfect place for a weekend getaway! On my way to visit a friend, here I found a 2-floor stoned house seemingly like a castle. One two three knocks on the door, breezed in as the door opens, I found myself fascinated by the traditionally built yet a homey and comfortable home for the two loving and kind couple. As I give my greetings to the couple, the fine young man welcomes and offers his chef-made savoury and sweet crêpe waiting on the table. Hello Sydno, thank you for welcoming me here and for agreeing to be interviewed! Let me ask you a few private questions and your thoughts on xat. Please try to answer these as honestly and completely as possible. My thanks to you for interviewing me, I’m glad to welcome you here. What’s your real name, how old are you, where are you living and what are you studying/working now? My real name is David and I’m 21. I’m living in France, more particularly in Brittany, near Rennes although I come from a village next to Lyon. I’m currently studying statistics and data science and I will soon start working in banking risks and finance. I’m an INTJ(-T), a naive one. This defines me perfectly. Check out the MBTI profiles and test if you want to know more about it. Do you speak any languages other than French and English? I do speak Spanish decently and I used to speak Latin as well. I’ve also learned Italian for 4 years and have basics in Portuguese and German. However, I’m better at understanding so mea culpa if I do any mistake. For how long have you been on xat and how did you discover xat? I’ve discovered xat in February 2011 on a French anime website called Ratus13. I may have been on a xat group before, in 2010 – this is how I got my 289909325 ID – but I didn’t spend time on it: I was looking for a gaming friend whose name was “HoneyMoon”. All I remember is that at the top of the list, there was a “HoneyPie” guy, I thought it was him, clicked on it and it was actually my toon name. I didn’t realize it until I actually discovered what was xat. When I re-discovered it, I was attracted by those weird audies I could hear during my anime times. I started discussing, made a few friends and actually became very active. At the time, only the website administrator had a rank on the chat. He started trusting me and I ended up as a Community Manager of the website, i.e a Main Owner on his chat. I made the chat very active and other xat users from other groups arrived. This is how I realized that xat was like a giant universe where each planet was a chat and that you could travel from a chat to another – brilliant! LeBlogdeRatus13 became the most active French xat chat after a few months. I’m very proud of this, I met so many great people, including many IRL friends now. Nonetheless, I actually didn’t spend 7 full years on xat. I took a 2 years pause for my competitive studies, Spring 2014 to Spring 2016. When I came back on xat, many things had changed but this was very exciting. Many users I used to know as new official chats members ended up as contributors or chat managers. I was amazed. To be honest, it already seemed low tier in 2011 but the audies, the atmosphere, that was so cool. We all had toon weird pictures, that was unique. My biggest shock was when I realized you could register to xat and have subscriber days, xats and powers. I felt a whole new world was revealed. Scar, who was just appointed as Aide main owner at the time, saw my chat growing and taking a huge place in the French community. He came to my chat – I didn’t know who it was – and everyone was surprised by his presence. We discussed and at the end, he offered me the member position on Aide (French helping chat). So yes, I did not even need to earn my first position on an official chat, this was pure luck and cooptation. I was glad but also very annoyed when I had to help users on the first days – like what was I doing here?! I doubt he’s reading this but despite everything that later happened between us, I thank him a lot for giving me a chance. Hopefully, I learned fast and was really interested and dedicated, 3 months later, I was an Aide owner and I did completely deserve this one. I guess this was in late 2011. Alongside, I started having ranks on Commerce (French trading chat) and started spending time on xat_test chat. This made me register on the xat forum in December 2011. We all know that you like to help people and have a lot of good friends on xat, do you have a role model and who do you trust a lot on xat? I met loads of good friends on xat. I met some of them IRL and I continue talking to them. As for now, I have fewer friends, but many more acquaintances. I would like to know all of them better but this is just impossible. I also would like to avoid building relationships with users that are simply attracted by my positions. I’m glad you asked me the role model question. This may surprise many people but my role model is Danns. I think we don’t even know each other that well but he inspired me so much in his way of managing a chat, staying both cool and professional. He was always trying to get the better of anyone and would positively give a chance to everyone, he was also always looking for compromises rather than taking blunt decisions based on ‘principles’. We have heard that you met your fiancée on xat, when and how did you met her? Can we hear the wedding bells soon? It’s a tough question. Certainly not 2014 and 2015. Otherwise, I feel I’ve achieved great things each year. For the sake of picking a year, I would say 2011, just because I met my fiancée this year. In the end, she is the reason why I feel so beholden to xat. I do not think anything about the xat community. However, I have plenty of opinions about the xat communities. Willing to unify them is a false good idea. On this matter, I think xat should have appointed sub-managers in key countries to develop the website within each community. This did not happen and this lets the English community think they are the most legitimate. We tend to forget that most important xat communities probably are Turkish and Romanian. My answer is a bit off-topic but this is very important to notice. Despite one may think, I love every single community, including those who are considered “toxic”. I just believe that each community should have its own place (this does not mean having an official place) rather than trying to change others community with their own principles. Yes, some people are looking for fewer rules, but also yes some people are looking for quiet and calm places. I have mixed feelings. On the one hand, I’m very positive about some changes that occurred this year (and are occurring) because I know for sure these are positive changes. I consider 2018 an important transition year for xat. On the other hand, I feel more and more tired by the users who repeatedly say xat is a dead website. Honestly, this just sounds like these guys are wishing for the website to die yet continue to spend their time on it. Please make a decision, either leave, either stay and look for the positive! Of course, xat will be dead if anyone goes around saying it is dead. I’m also convinced xat can continue living for a decade if we all act positively. As long as I will be able to. In the worst case scenario, April 2019. In the best? I’ll still be here in 10 years. Kpeng. A friend of me, a former Aide main owner aka Sundae/xKey who used to be rewarded the ID (252525) made it. It’s also because I love penguins. This goes without thinking, Chat, the International xat Chat! I’m so proud of my staff and of our user base. It’s like a home for me. I do not if that counts as events but I loved xat5 monthly reset. Everyone was looking for the new main owner who would often use invisible or $tealth to trick others before revealing. This was as important, if not more, as it now is to announce a new contributor or volunteer. We used to say that monthly mains were a way to test users and see if they were reliable. I think this was only true for users from the English community. You are a main owner of two official chats, a wiki team member, a Contributor and a volunteer now, was it a goal to reach on xat? Definitely, yes. I have always been very ambitious. Although I never wanted to have ranks or positions for the sake of it. I just knew it would allow me to help the best I could. For Ayuda, it is more a concurrence of circumstances, though. As a part of the Contributor group, what are your opinions on the Contributor system? “Democracy is the worst form of government, except for all the others.” – Churchill. This describes why the contributor’s system is both a terrible system yet the best one we could use. We are always looking for ways on how to improve it but this is never enough. On the other hand, I think we currently have a good group of users. We all come from different communities and chats. It cannot really be more diverse than it already is. Did becoming a Contributor and a Volunteer change your chatting experience on xat? Becoming a contributor did not change anything, especially since I was a wiki editor years before I became one, after I came back from my 2 years pause. Although, becoming a volunteer changed it a lot. I will always keep NoPC off and it’s always nice to help you all but sometimes, I just wish I could relax and take time for me. Becoming a volunteer did not change me, however, it changed the way others look at me a lot, unfortunately. As a part of the wiki team, what is your role on the wiki? I’m a wiki editor first and foremost, even though I’m not extremely active on the wiki these days. I think I have a special place on the wiki since I’m the oldest editor still in activity. I was made an editor in August 2012, mainly for creating articles in French. Scar was taking a 2 months holidays off xat and made me Aide co-main owner. He suggested me to ask Admin to edit the wiki during his absence. So, I just asked and they made me a wiki editor. I had vouchers for trust however, this wasn’t random. At the time, wiki editors were even listed on the volunteers wiki page! I was so proud. Proud but delusional, the volunteers never recognized me as an actual editor. I think I was just a random foreigner for them. When Cyan added the Translation extension to the wiki, I was kept as an Editor and continued to help a little in the shadow during my pause off xat. When I came back, this was all I had so I worked really hard for the wiki. I was later made a Senior Editor and an Account Creator. This more or less means I can mark pages for translation and add new translators to the team. Can you tell us your views about the xat wiki? It’s more than a tool and it’s underrated. If you carefully read the wiki, you know more than enough to be a moderator in a help chat. There’s still a place for improvements but you should definitely look at it when you have a doubt. On this matter, Andre was a breakthrough for the wiki. Cyan introduced the new extension, which was great, but Andre pushed it to a whole new level. He completely deserves his wiki admin position and no one else will ever be able to do better than him. What is your favourite help support? I do not have a favourite one. They serve completely different purposes. If you want instant help and support, you should visit a Help chat. 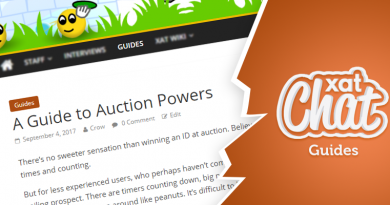 If you wish to learn more about xat or to find out something tricky, the wiki is for you. If you want a detailed answer, ask on the forum general support. If you have issues with your account, then you do not have other choices than making a ticket. We also know that you are the main owner of Chat and Ayuda chat, when did you become a main owner of these two official chats and tell us about your experience as the main owner of these chats? Shame on me but I do not even remember when I completely took over Chat. This is positive though, this means the transition was more than smooth! I was an original owner of Chat when Adam made it. A few years later, the wiki team took it over. I felt bad about Daniela, the previous manager, but I was glad to help again. Eventually, after some months, everyone felt disinterested in Chat. Rida owned it but always said she wasn’t very interested. She tried making monthly main owners but it wasn’t a great success in my opinion. Finally, she decided to give it to Andre who realized I was very involved and dedicated to the chat and who decided to hand me over the chat. During all that time, my only wish was to make Chat a place Adam would be proud of. Chat had rough years but I think I accomplished my goal. As for Ayuda, it really is a concurrence of circumstances. The previous main owner was leaving, no one felt confident about directly picking a new main owner. We decided that a volunteer could own it and look for a new main, smoothly. I offered to help and this is it. This happened less than 3 months ago. You have been appointed recently to manage Ayuda chat for the time being, can we hear a little more about your plans for the future of Ayuda and what we can expect? I’ve made an important post on the general forum about it. I’ll not repeat it again but shortly I want to make it more active and to gather the different Spanish users from the different spheres of xat. The most challenging part is to make it a family. We made good progress in one month, I believe. It is going to take time and there will be no miracle but we’ll make it. 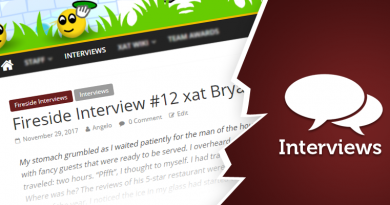 Aside from being committed to your work, being a volunteer and other roles you have on xat, you are also active on chats daily, so how do you manage your time on xat? I wish I had a magic trick. I try to separate my different projects. I often answer tickets before I connect to chats to be more efficient. On chats, I spend most of my time discussing issues, answering user’s questions and participating in meetings. In this regards, the forum is very helpful to get organized and I have dozens of group messages. With all the things you have achieved as a user on xat, do you have any motivational quotes you can share to our fellow xatters? Andre used to tell me “keep it up” or “keep up the good work”, even when I was doing simple things; this was helping me a lot. A prerequisite to this is to always stay positive. Sometimes it takes years for others to notice your work, especially if you’re from a foreign community. Stay positive and keep it up, this will be noticed and rewarded. We have come to the end of this interview and once again thank you for agreeing to be interviewed! Do you have any last word to conclude this interview? I always have had a lot of things to say and to share, and even after this interview, I still do. However, I never know if users are actually interested in it. Let me know if you’re interested in reading a “How I become a volunteer” article, I’d gladly tell how and try to make a more in-depth analysis. Anyway, I hope that you enjoyed reading this. Great interview! you can notice the humility of sydno from so far away. He’s always kind, really.